armed robbery | Comics I Don't Understand - This site is now being updated daily at http://www.comicsidontunderstand.com. Please change your bookmark if necessary, and notify any web site with a link to the old address. All that sports memorabilia O.J. Simpson allegedly tried to steal at gunpoint last week, claiming it was legally his… whether or not Simpson is found guilty, any of the memorabilia that turns out to have been legally owned by Simpson… will get handed over to the Goldmans. And the publicity generated by the robbery couldn’t not have increased sales of the book (as of Tuesday morning, it’s the #2 best seller at Amazon.com). If Who Did It (September 17): Okay, what’s the weirdest thing about last week’s release of O.J. Simpson’s hypothetical double-murder confession (as if this whole affair needed any more weirdness)? No mention of Simpson’s name on the cover. 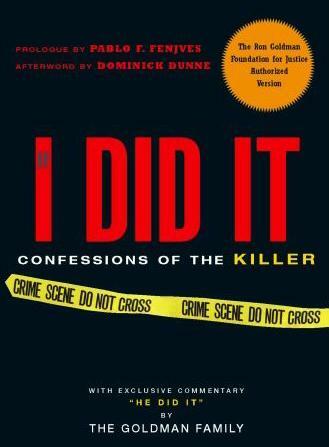 It’s a confession without a confessor.Or even worse than no confessor: Amazon.com is marketing the book as “If I Did It by the Goldman Family”. O.J. Simpson’s hypothetical double murder confession, the rights to which are now owned by the family of murder victim Ron Goldman, has been contracted to a publisher [updated article].